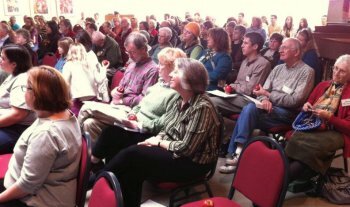 The Unitarian Universalist Fellowship of Ames (UUFA) is a welcoming community, seeking to provide opportunities for people of all ages to grow in their spiritual and ethical lives, and finding the means to engage the world in creative and transformative ways. Here members and friends are encouraged and empowered. Here they are excited and involved. Here we express true meaning of fellowship and togetherness. Members are encouraged to "dive in," to get involved and make an impact. From Sunday morning programs to budget decisions, we foster a high degree of participation by everyone in the congregation, reaching throughout our congregational life and into the community. Expressions of our religious beliefs are manifest in our lives; what we do is what we believe. These expressions are apparent as we teach our children of their own value as human beings and help them gain an appreciation for the strength in the human diversity of our world. They are apparent as we embrace the plurality of life and expressions of self and identity by being a Welcoming Congregation, or as we seek to become a Green Sanctuary, a program that helps us monitor and reduce our negative impact on the world's environment. Theologically, the UUFA is home to liberal Christians, pagans, Hindus, Buddhists, religious humanists and those for whom any definition would feel limiting. Theists and atheists alike seek answers to the difficult question of living in our religious home. The Fellowship is not a place for everyone or every idea, but we seek to keep our hearts and minds open, learning from each other ways to help create a world based on the principles of compassion, love, and justice. If we can be of service or you are looking for a place to grow, please come visit us!